Food Products From Trees: Numerous fruits, nuts, honeys etc. Other Products From Trees: Timber, firewood, paper etc. The World’s Tallest Tree Is Called Hyperion − and He’s in Hiding! In terms of botanical classification, there are certain tree facts which are used as criteria to define a plant. A tree is perennial, meaning it lives for longer than two years. Features of a tree include a trunk, supporting branches and, in most cases, leaves. 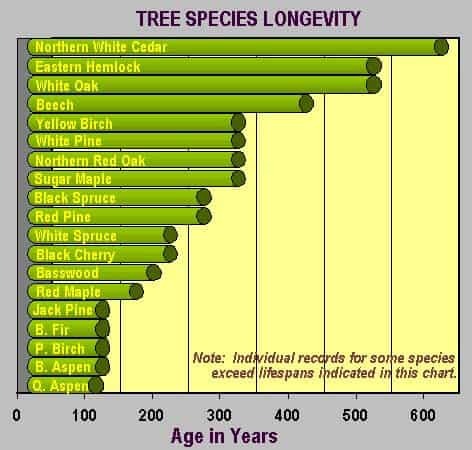 Trees are generally long lived − some can live for thousands of years. In order to manage this, trees have thick stems for durability, and they are able to grow taller than non-woody plants and spread out their leaves to compete for sunlight. The difference between a small tree and a large shrub is not always apparent, however. Some botanists define trees in a narrower sense; for example as only woody plants usable for lumber, or as plants growing to above a specified height. One of the most important tree facts relates to how these plants get their energy. Trees use a chemical change which converts energy from sunlight − photosynthesis. This process begins when chlorophyll pigments in the leaves of the tree absorb light energy. They use this energy to create a reaction between carbon dioxide and water to make the sugar glucose. This glucose is then either used for respiration or is converted to starch and stored. Oxygen is the by-product of this process, and the tree releases this into the atmosphere. The water needed for photosynthesis, and other important nutrients for healthy growth, are taken up from the soil by tree roots. But there are many tree facts relating to the usefulness of roots. The roots anchor the tree to the ground, as well as being used to store energy. When a seedling is growing into a tree, the first part of the seed to emerge during germination is the root. It begins as an embryonic root, and then becomes a taproot growing directly down into the soil. A few weeks later, lateral roots begin to grow horizontally through the earth. On the roots themselves, single cell root hairs come into contact with particles of soil, and absorb the nutrients and water needed by the tree. When it comes to plant and tree facts, one of the most important differences between a shrub and a tree is a tree’s woody trunk. The main purpose of this trunk is to keep leaves above the ground, which helps the tree to reach light and allows photosynthesis to occur. It also enables the tree to grow above other plants and shade them out. In addition, the trunk allows for the transport of nutrients and water from the roots up to the branches, and distributes the food produced by the leaves. Tree trunks are covered in bark, which acts as a protective barrier. However, certain types of insect are able to bore into the trunk and lay eggs in the crevices. The damage created when they chew into the bark can form tunnels, in which fungal spores can grow. 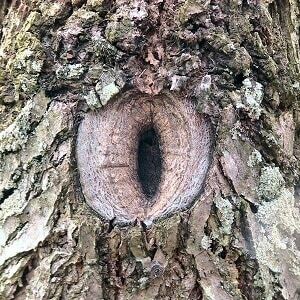 This can cause the tree to become diseased. Trees are similar to other plant forms in that they reproduce via pollination. However, there are interesting tree facts regarding how these particular plant forms have evolved in their reproductive processes. Generally, trees are wind pollinated. They are well adapted to this method of pollination, because of their size and height, and higher wind speeds further from the ground can be taken advantage of. Trees produce a great deal of pollen, and have both male and female flowers. One of the more astounding tree facts is the extreme age of this plant species. The earliest tree-like plants were found in the Carboniferous period, during which the dominant land vertebrates were amphibians. Even reptiles had not yet evolved. Early tree-like species included lycophytes and tree ferns. It is believed that the first tree was Wattieza, a prehistoric tree genus that is now extinct. The Wattieza is believed to have had fronds rather than leaves, and reproduced using spores. 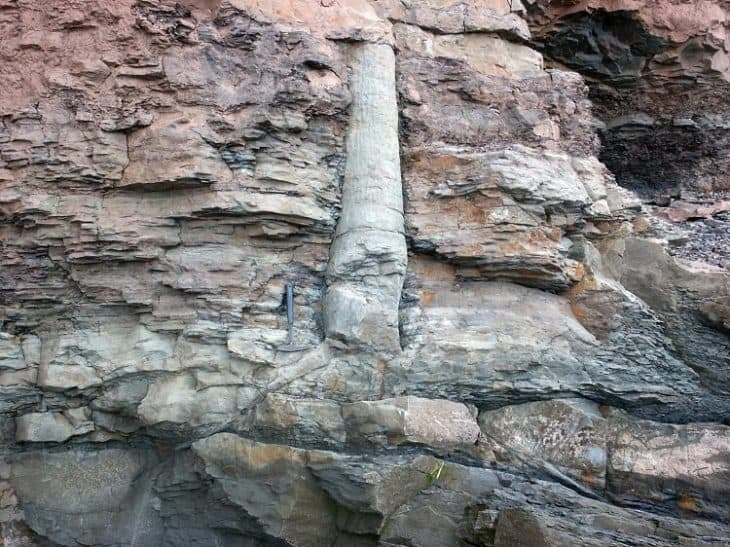 Fossils of this tree were discovered in New York State in 2007, dating from around 385 million years ago. Tree facts are closely connected to our understanding of environmental issues. During photosynthesis, trees remove carbon dioxide from the atmosphere and replace it with oxygen. A tree can absorb as much as 48 pounds of carbon dioxide per year, and much of this is stored. This helps to moderate the earth’s temperature. Furthermore, tree roots help to reduce erosion. This is why deforestation is having such devastating effects, contributing significantly to global warming. Ecologically, trees also sustain life in a variety of ways. They provide a natural habitat for many animals and plants, and rainforests in particular are incredibly bio-diverse. Since the beginning of humanity, trees have provided us with many necessary resources for survival, such as shade, shelter, fuel, food and timber. 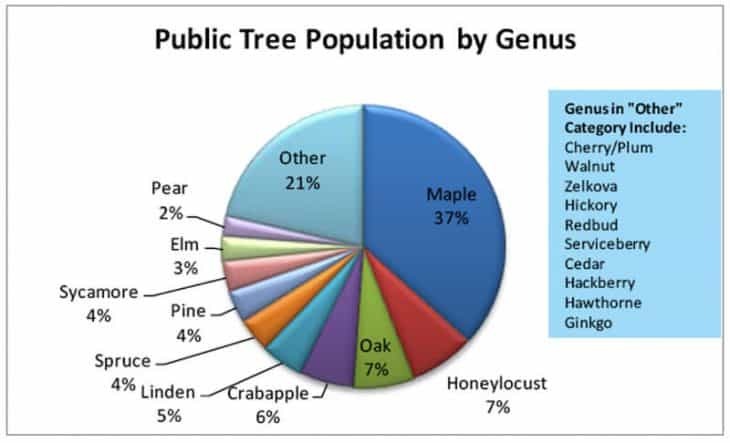 One of the more intriguing tree facts involves the sheer number of tree species that there are − around 100,000 that we know of. These include deciduous and coniferous species. Deciduous trees have broad, large leaves, which tend to drop in the fall. Deciduous trees are mainly hardwood, and are often grown for timber. Some examples of common deciduous trees include maple, birch, beech, poplar, elm, ash, oak, willow, hickory and chestnut. Coniferous trees, on the other hand, are identified by a different criteria of tree facts. They are often known as evergreen, because they remain green all year round and do not drop their leaves in the fall. They are able to survive in even harsh climates. They often grow in triangular shapes, and have pointed, needle-like leaves. Their timber is usually of the softwood variety. Common types of coniferous trees include pine, juniper, cedar, hemlock, fir, spruce, yellowwood, cypress, yew and alder. One of the most undeniable tree facts is that we humans would be nothing without them! 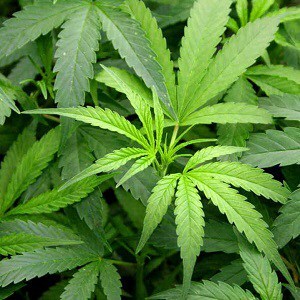 We get literally thousands of products from trees. One of the best known is fleshy fruits, including pears, apples, cherries, plums, oranges, lemons and so on. The fruits of the cocoa tree provide the base ingredients of chocolate, and coffee beans are extracted from the berry of the coffee tree. Edible nuts are also an important product from trees, such as coconuts, walnuts, almonds, pecans, pine nuts, hazels, pistachios and many more. As well as the edible products we extract from trees, the wood is also essential, both for fuel and for the timber we need for construction. A glance around your average household reveals some simple tree facts − we use wood for everything, from furniture to floor boards, and from bookshelves to baskets. Another vast industry based around trees is the paper industry. Paper is made by pulping wood fibers, which are then dried into flexible sheets. On August 25 2006, naturalists Michael Taylor and Chris Atkins made an incredible discovery in the Redwood National and State Parks, Northern California. They came across the tallest known tree in the world, a coast redwood measuring at 379 ft. (115.6m). They named the tree Hyperion, and estimated that he was 700-800 years old. However, it was feared that these incredible tree facts, once they made the news, would create a tourism boom. There was concern that visitors would flock to see Hyperion, and that this could upset the ecosystem in the park. For this reason, Hyperion’s exact location has never been revealed. Hyperion is not the only extraordinary and famous tree. Methuselah, a bristlecone pine in California, is thought to be nearly 5000 years old, making it the oldest known tree on the planet. There are other contenders for the title of most beloved and renowned tree. These include Washington’s Japanese Fire Tree, which is frequently photographed due to its vivid foliage. There is also the Angel Oak Tree in South Carolina, which is believed to be 1500 years old, and is considered by many a symbol of the state. And in Scotland, the Birnam Oak, also known as Macbeth’s Oak, is the last remaining tree from Birnam Wood. This wood, of course, played a crucial role in the Shakespeare play. The witches’ prophecy seems to be fulfilled when the advancing army storm Macbeth’s castle, under cover of the trees. There are numerous tree facts related to mythology, since trees have taken a central and often sacred role in the folklore of almost all cultures. In Norse mythology, for example, there is a particularly sacred and impressive tree, Yggdrasil. Yggdrasil is, in Norse literature, an immense yew tree where the gods sometimes assemble. Its branches extend to the heavens, and its three roots connect it to other worlds. Inside the tree are terrifying creatures, including the Wyrm (a kind of dragon), an eagle and several stags. The tree facts surrounding the modern Christmas tradition of decorating an evergreen tree are unclear. Historians generally agree that Christmas trees were first decorated for the holiday in early modern Germany. Some believe that Martin Luther himself, the famous protestant reformer, was the first to add lighted candles to the tree. However, the symbolism of evergreen trees is also important in Pre-Christian winter rituals. For the ancient Egyptians, Hebrews and Chinese, evergreen trees were a symbol of eternal life. The tree facts you might have heard about trees being dangerous to be near in storms are no myth. Although humans have always found shelter in forests and woods, during a storm is definitely not the time to do so! Trees are negatively charged, and lightning is positively charged, so trees often get struck. On top of that, electricity always takes the path of least resistance, which means the tallest object will be struck first. Better to be wet than fried! As our round-up of tree facts has proved, trees are not only magnificent to look at, but are also incredibly important for the environment. One person who would certainly agree is activist Julia Butterfly Hill. Between 1997 and 1999, Hill lived in a California redwood tree for two years in order to protest against the Pacific Lumber Company. She affectionately named the tree − which was 180 foot tall, and around 1,500 years old − Luna. Hill succeeded in stopping the logging company from cutting the tree down, and has since written a book about her experience. In 1954, Helen Puz was given a girl’s bike, and gave it to her son Don. Don, however, felt embarrassed to be seen riding it, and hid the gift in the wood, telling his mother he’d lost it. Over 50 years later, the bike was discovered − 5 feet in up the air! A tree had swallowed the bike and continued growing around it. And this infamous Washington State tree is not the only one with an apparent iron deficiency. A sycamore in the Scottish highlands swallowed not just a turn of the century bicycle frame, but an anchor and some iron tools too! In 2010, there were huge floods in areas of Pakistan. To escape from the rising water, millions of spiders climbed up into the trees. When the flood levels went down, the trees were completely engulfed in spiders’ webs, appearing as a ghoulish and tangled mass! Yet while they looked spooky, the newly adorned trees had a useful function. They actually reduced the mosquito population in the wake of the floods, helping, in turn, to reduce levels of disease in the unsanitary post-flood conditions. During the First World War, two army regiments were created from special forestry engineers. These men were tasked with the mission of supplying the necessary timber for the Allies’ effort. The men in these units were American, and came from a range of backgrounds in the US forestry industry, including rangers, loggers and sawmill workers. The timber they procured was used in many vital construction tasks during the war. For those who know their tree facts, navigation becomes a much easier task. Moss grows on the shadier side of a tree trunk, so in northern climates, you’ll know the side with the most moss is the north side. And if you find a tree stump, even better. Tree rings do more than reveal a tree’s age − in the northern hemisphere, the growth rings are slightly thicker on the southern side, since this is the part of the tree which receives the most light. In the southern hemisphere, the opposite will be true, so expect moss on the southern side and thicker rings on the northern while in southern climes. As our collection of tree facts has shown, a tree is defined botanically as a perennial plant with an elongated trunk, branches and leaves. Trees have been living on earth for over 380 million years, and individual trees can live for thousands of years. They can also grow to incredible heights − currently the tallest known tree in the world is the coast redwood Hyperion, which measures in at 379 ft. (115.6 m). There are over a 100,000 different types of tree, both deciduous and coniferous. Trees are incredibly important, both to the environment, and to human culture, for they have been central to our mythologies and religious practices since the days of early civilization.